As memberships go, ACCS membership has substantial requirements. 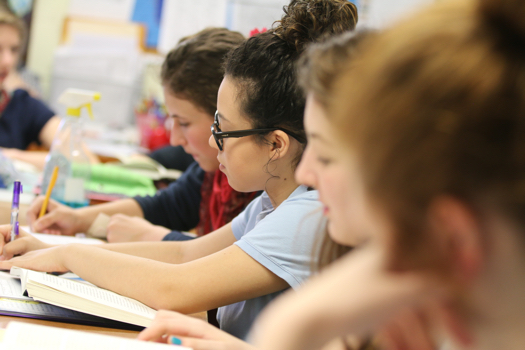 To become members, schools must affirm standards regarding their faith and educational vision, and certain practices unique to classical Christian schools. Our member schools affirm their compliance annually. 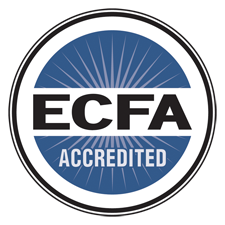 Accredited members meet our foundational standards for a classical Christian school. ACCS staff validate and oversee the process to ensure compliance. In addition, we send periodic evaluators (typically the heads of other, larger ACCS schools) to verify the school’s compliance. Unlike other accrediting agencies, we verify the classical nature of the school’s teaching so that it reaches a foundational set of requirements. For schools that are transitioning, the ACCS offers Transitional Membership (indicated in our School Finder) for up to 5 years. These schools are working to meet our full member requirements. Why should I seek an ACCS accredited school? 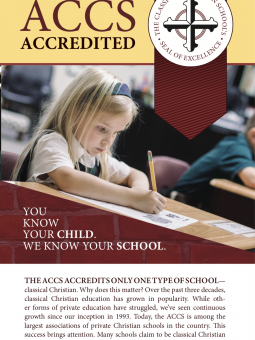 The ACCS offers the only accreditation specifically for classical Christian schools. Our process helps parents have confidence that the school their children attend is partnered with the ACCS and its resources to ensure quality, improvement, and commitment to the vision. With the popularity of classical Christian education, we help parents identify those schools which truly follow the classical Christian model. While the ACCS accreditation process follows a familiar pattern of self-study followed by on-site visit, the focus of this process is carefully targeted at the most important elements of successful schools. Student participation, conduct, and development. The overall spiritual demeanor in the school classrooms. The integration of Scripture throughout their schools curricula. Conformity with classical Christian methods in their classrooms. 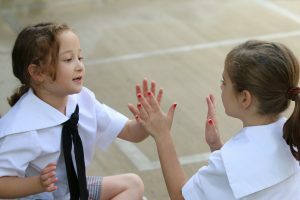 When schools are accepted as accreditation candidates by ACCS, they gain a partner who is committed to helping schools improve through the accreditation process. Transferring students from ACCS schools into public k-12 schools may be more difficult in some cases. Sports leagues and extra-curriculurs may be more limited for ACCS accredited schools. Colleges scholarships which require a state-certified diploma may be impacted. College admission is generally not affected, but may be in rare cases. Several colleges offer exclusive ACCS scholarships and many others specifically seek ACCS graduates. 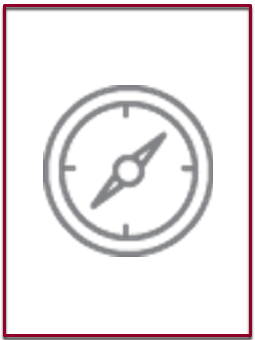 ACCS accreditation is specifically recognized in states that have private entities for private school accreditation, including: Georgia, Oklahoma, South Dakota, Texas, and Virginia. Why is independence so important? We encourage you to read our statement on independent accreditation. 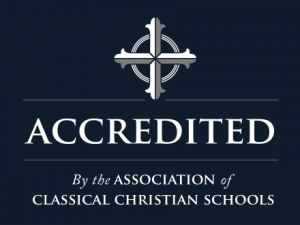 The standards for the ACCS classical and Christian School accreditation program are available to all. The accreditation handbook, which contains all of the information necessary for schools deciding whether or not to seek accreditation, is available by request. Note: This document only contains the standards for accreditation, not the application for school accreditation or other materials required for ACCS school accreditation. Page numbers reflect pages excerpted from the complete handbook. Click on the above link to download the standards. To receive a copy of the full accreditation handbook, click here. PDF copies of the handbook are available at no charge. We do require that you send your contact information. Once schools are approved for candidacy status, ACCS becomes a partner with the school. ACCS and the school will work together to see that the school understands and is prepared for each step of the accreditation process. Candidate schools are welcome and encouraged to check with the ACCS Executive Director as they work through the accreditation process. He may also refer you to headmasters at other ACCS accredited schools who will also assist in answering your questions or who may be able to provide you with examples to help you as you work toward accreditation. You may also want to consider, as circumstances permit, observing an accreditation visit at another ACCS school. This would need to be coordinated through the ACCS Director of Accreditation and paid for by the candidate school.